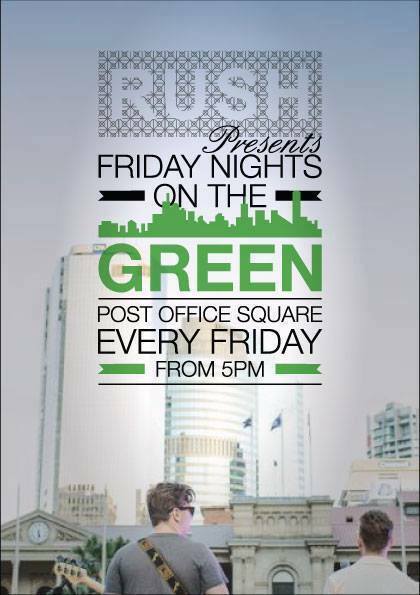 Every Friday night from 5.00pm, Post Office Square comes alive with Friday Nights on the Green, a pop up bar and restaurant hosted by Rush Bar and Dining. You can enjoy music featuring local artists as part of The City Sounds, Australia's largest free live music programme. Enjoy music from local artists. This makes for a great casual start to your Friday evening. You can book a table or, if you prefer, you can relax on a rug with friends under the stars while enjoying live music, drinks, gourmet burgers, tapas and pizzas. Pull up a chair or relax on one of the blankets provided. We've enjoyed Friday Nights on the Green several times, each time with great food and friendly, quick service. There's a bar menu with the standard fare such as pizzas, bread and dips, burgers, etc, or if you prefer something a little more substantial, you can order from Rush's everyday a-la-carte menu. Pizza with prosciutto and avocado, one of a variety of pizzas on offer. Barramundi risotto cakes with sweet chilli jam - creamy and delicious. The band finishes at 8.00pm, however you can stay put and enjoy yourself at Rush or kick-on to somewhere else in the CBD. This is a great, casual venue for after work Friday drinks and a bite to eat instead of one of the many noisy bars around town, especially for Brisbane CBD workers. Kick-start your next weekend by calling Rush Bar and Dining to book a table - all that's left to do then is turn up, order your favourite brew, relax and enjoy. Why? An enjoyable, chilled out way to start your weekend.